Many of us know what’s it like when trying to lay down, but the noise of the outside, or inside the house, that keeps us awake. It feels as though every noise, creak or sound can be heard when we are trying to rest our head or fall asleep at night. While a soundproof room may not be within your budget, or realistic, there are alternatives in helping combat the sounds or sights that keep you from getting a good night’s rest or the privacy you desire. Introducing noise cancelling curtains, an alternative method that will not only help you sleep better, but also cancel out all noise and lights that keeps you from your peaceful slumber. Aside from aiding you in your sleep endeavors, these curtains also add some flair to your bedroom or any room where canceling out sound and light is your top priority. They can also offer savings in your energy bills by insulating your room during the winter and summer seasons, an extra benefit when considering purchasing the best noise cancelling curtains. I will be going over seven of the best noise cancelling curtains that are available in the market. Let’s take an in depth look to see which of the best noise cancelling curtains are the right fit for you in getting a good night’s rest. 1 Why Invest in Buying Cubicle Curtains? Why Invest in Buying Cubicle Curtains? When choosing the best noise cancelling curtains one must take into consideration where they are going to put them, are there better options out there and if these will meet the desired needs of the consumer. You also must consider your expectations versus reality. Curtains, while extremely helpful in reducing noise and light, cannot totally eradicate it all together. To get the ultimate results from your noise cancelling curtains, it seems best to get darker colors with more layers fused into it. Most vendors who sell drapes will subtly mention how the darker curtains are more effective in reducing light and cancelling out the noise to a lower level. If you are looking to get the best results from your noise cancelling curtains, then I highly recommend going for a darker color versus a lighter one in the first place. Along with the infusion of more layers, be sure to see which vendors talk about their 3-in-1 technology or offer any hint of the curtain’s makeup. The more layers that are sewn into the curtain, the better results you will have. Check out the video below to get a better understanding of the internal makeup of a noise cancelling cubicle curtain, and why one may fit your needs better than others out there in the market. 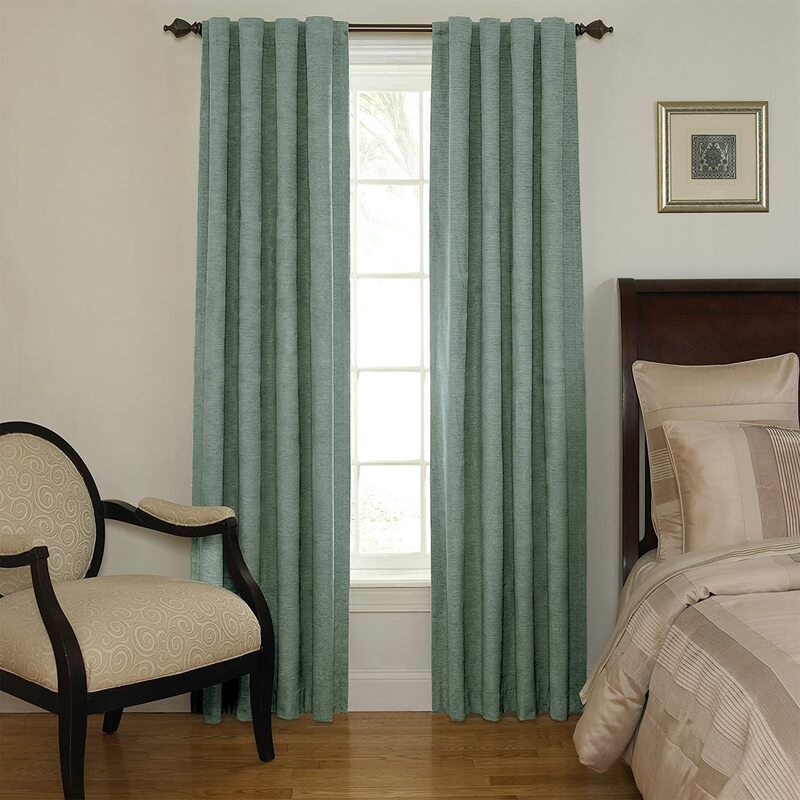 These the noise reducing curtains are made of 100% polyester and microfiber material. These triple woven curtains aid in blocking out about 85%-99% UV rays, and can filter up to 70% of audible noise. Their insulation can also assist in keeping a room extra cool in the summer or help in warming a room in the chilly winter days and nights. 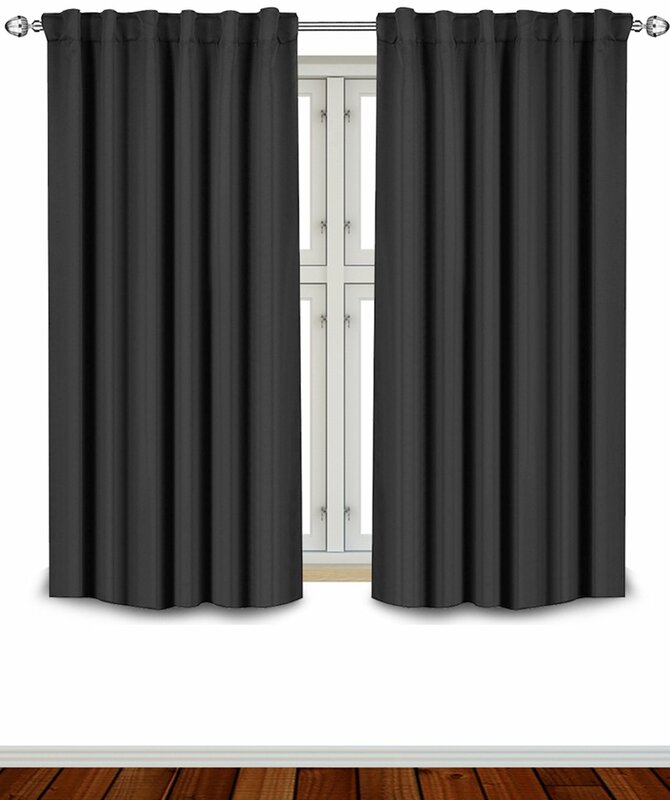 These blackout curtain panels also come in seven fun and elegant colors which can add flair or a nice touch to any room in your home. Alongside their print, which is simple and eye-catching, also adds a subtle touch of decoration that makes it more than just another curtain for your rooms. These curtains come in sizes 52″ x 82″ and 52″ x 96″. Be sure to measure the appropriate length for your windows and desired rooms. You can also easily machine wash these drapes at home with non-chlorine bleach and a low tumble dry. While I find these blinds appealing, I am not sure that I am sold on such a bold pattern for room curtains. They appear to be more fitting for a teenage room than something that I would put in my main rooms. These solid window drapes ensure up to 85%-99% light reduction, along with thermal insulation and noise cancellation. They are made of microfiber material which is soft to the touch, but strong in its weight and quality for longevity. Their high-quality makeup help lower your energy bills by keep your rooms at a comfortable temperature all year round. They are easy to clean, and they are wrinkle free, which saves you the hassle of fighting wrinkles after cleaning them. These curtains are easily machine washed in low temperatures and can placed in the dryer on a low tumble. These eclectic window curtains come in 17 colors that can be utilized in most rooms. They also have more of a variety in weight measurements. From as small as 52″ x 18″, to as long as 52″ x 95″, with a plethora of measurements in between. I like the solid colors better and find that they would fit more of what I’m looking for in a curtain. I like the look of the short curtains, as the long ones appear a little outdated to me and my tastes. Like other noise cancelling curtains, these blackout window drapes by Utopia Bedding promise noise reduction up to 60% and up to 99% in light obstruction. Their 250 GSM microfiber material ensures softness and high-quality longevity. 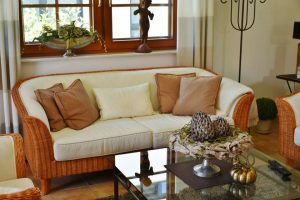 These insulated window treatments also keep rooms at a comfortable temperature, rather it’s a cold winter’s day or a hot summer afternoon. These curtains also come with a two tie back, so that you wrap the curtains back as opposed to just pushing them aside. 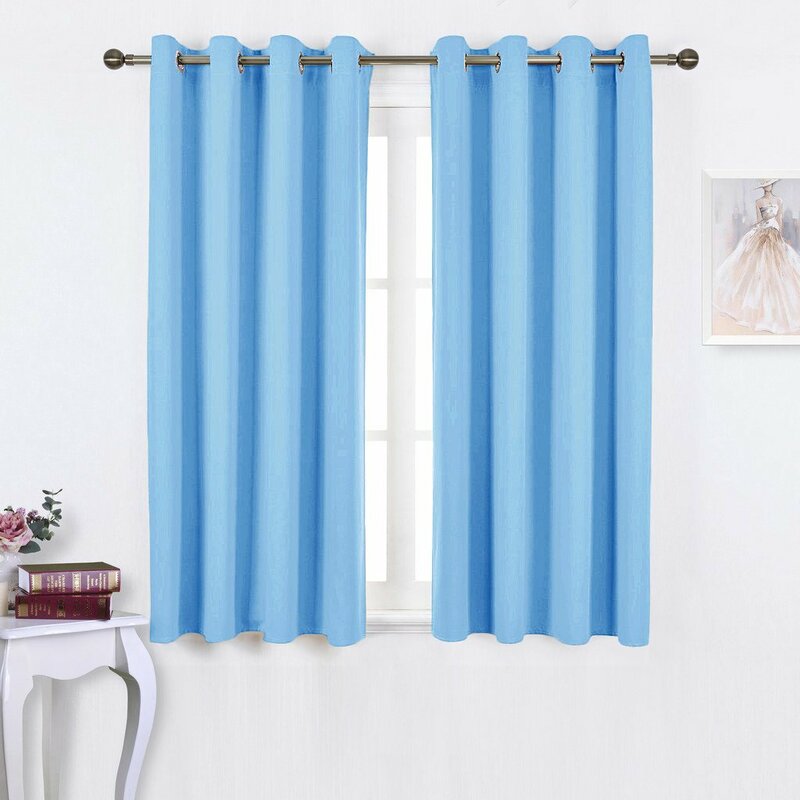 Even though they are noise cancelling curtains, they are the same color on both sides and have a sturdy weight to their build. They currently come in seven different solid color options, and two measurement sizes: 52″ x 63″ and 52″ x 84″. The colors are tasteful and add a nice pop to a room, without being too bold or out of place in your home. For personal care, you can also machine wash these curtains with non-bleach soap and use a low tumble to dry them. I personally like that there is one solid color utilized on both sides. This makes the drapes look high-end and not like they serve a purpose other than being decor for a window. The ribbon that ties it back is a nice touch, and the color choices make it easy to find placement for them in your home. This noise cancelling curtains are sold by one panel each, meaning that you must buy two of them to get a set. These thermal insulated drapes by Deconovo are offered in three different sizes with over 15 color options to choose from. The colored the same on both sides for a clean, consistent look. Silky to the touch, these curtains can reduce both noise and light, but have better results with the darker colored ones. They are made up with 230 GSM polyester material that ensures comfortable room temperatures throughout the seasons. These noise blocking drapes also offer the utmost privacy. These curtains pride themselves on low dust accumulation, which means no worries of dust mites or a frequent dirty appearance. To keep them clean, simply wash them on a gentle cycle. It is not recommended to tumble dry them, but to air dry and use a warm iron to get out any lasting wrinkles. The noise cancelling curtains by Best Home Fashion are made of 100% polyester for a soft feel and high quality make. Embedded with triple wave technology for up to 99% light reduction and ultimate privacy. The darker the color of the curtain, the more protection and noise reduction you will find with this brand. They offer a multitude of colors, all of which are solid and the same color on each side for better consistency. These curtains also highly insulated for room temperature control during the winter and summer months where weather leads to the extreme. There a variety of measurements, and based on the size you choose, you can get a tie up shade, a wider width or print pattern options. 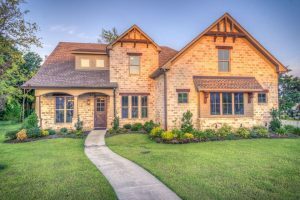 Be sure to look out for those options when choosing the size for your windows. These treatments are machine wash friendly when needing to be cleaned. These curtains seem to have it all: many color choices, polyester feel and provides amble noise and light reduction. The look elegant and would be a nice addition to any room in the house. 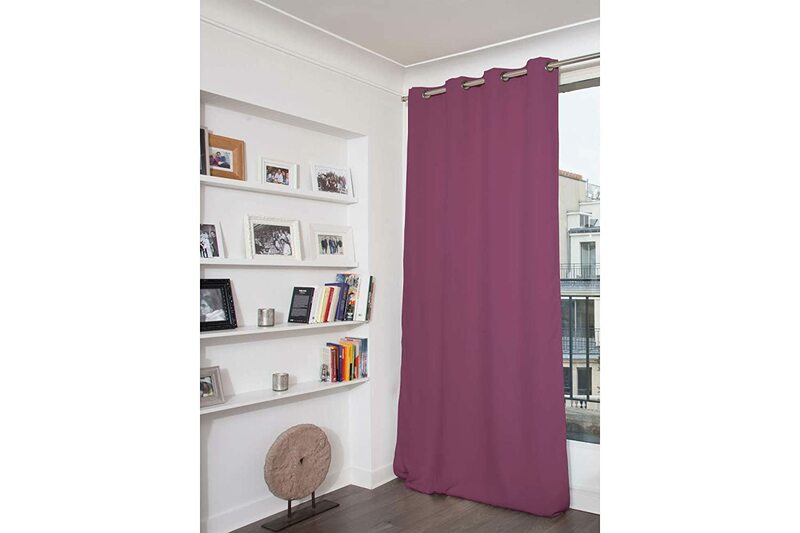 These room darkening and noise reducing curtains created by Beauty Rest are made of 100% polyester material. This material is soft to the touch but can feel silky depending on the person. 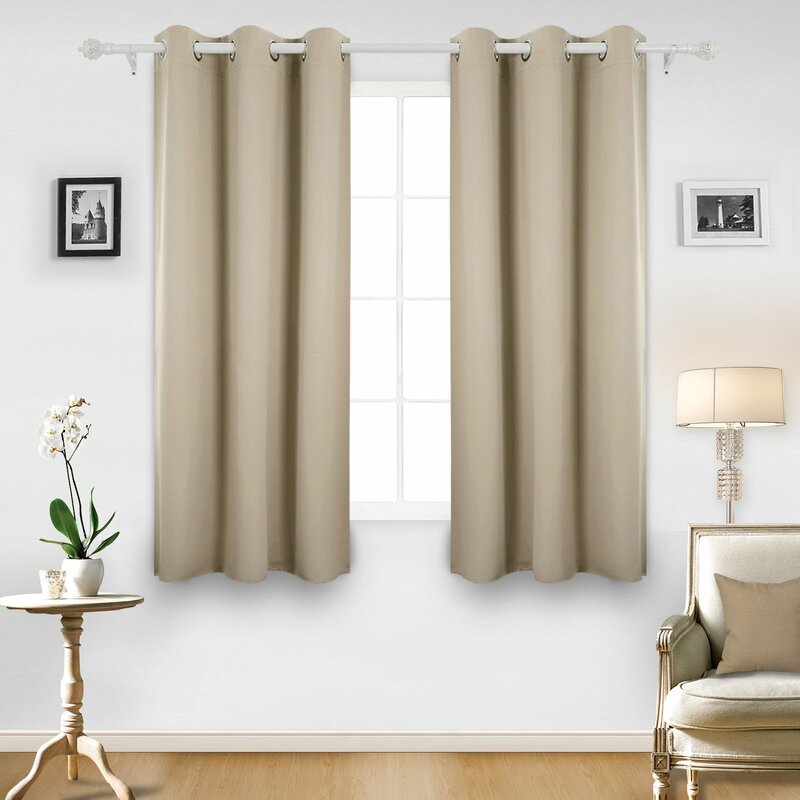 These drapes are sold as one panel, so the consumer must by two to make a full set. The Sound Asleep panels significantly reduce the amount of light that comes into a room, but still let a small amount seep through for a nice ambience to a room. They also contain thermal insulation for better temperature control and add an extra barrier of noise reduction and privacy to a room. These curtains come in six solid, yet textured, colors with different measurement options. The colors do not match on the back, as it is a white color for all curtain colors. For upkeep, these panels are easy to wash at home with your own washing machine. While these curtains claim to reduce noise and light reduction, it appears as though they are made for those who want less light, but still like an essence of ambience in their rooms. I am also not a personal fan of the two-toned colored curtains. I find that to be tacky and it takes away from the look of the room and the curtain itself. 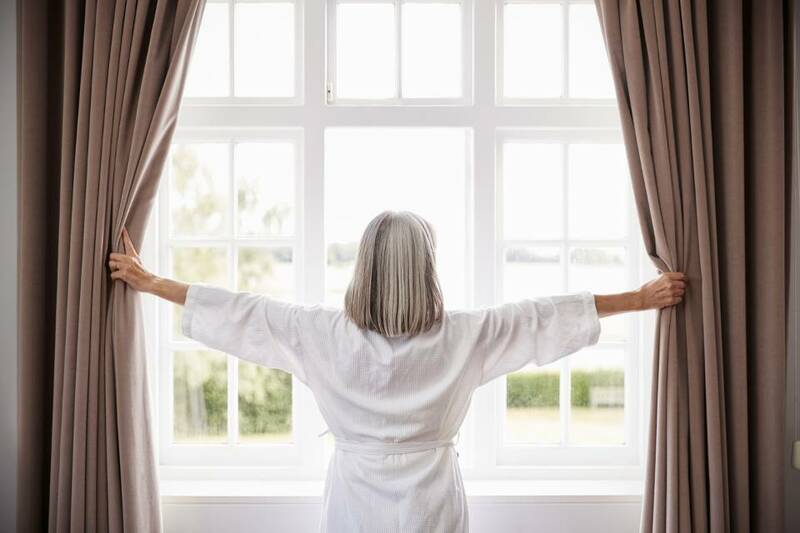 These independently tested curtains by Moondream pride themselves on three things: sound reduction of up to 7 decibels, 100% UV ray light reduction and lower energy costs for your home. 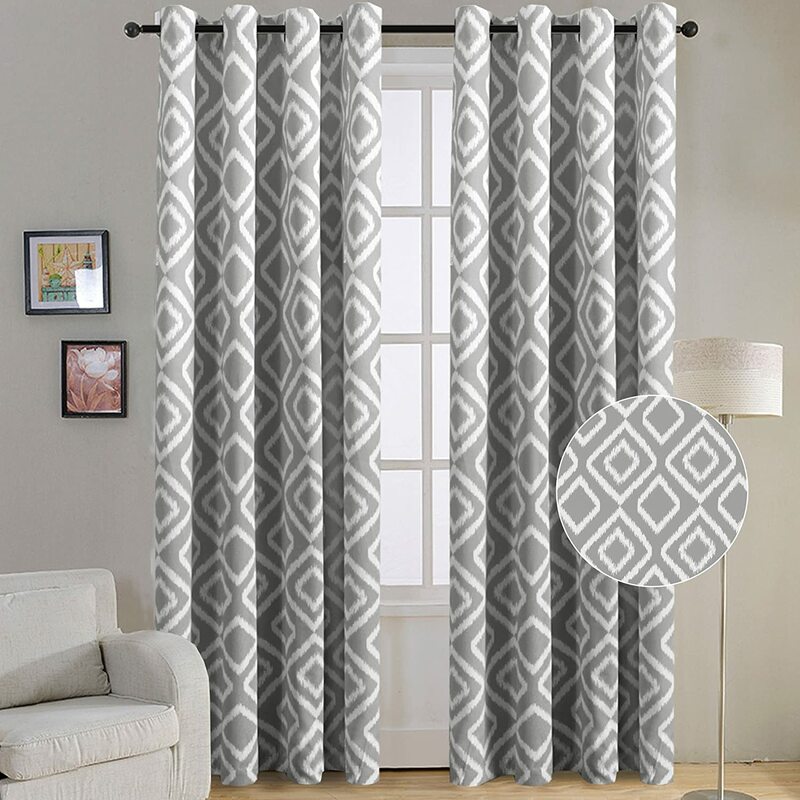 These insulated curtains are made of 100% polyester and weigh around four pounds each. The sturdiness of the material helps significantly reduce light, noise and increases the desired privacy of a room. They come in 12 solid color choices, with a two-toned back that is white. There are three distinct layers within the curtain that helps achieve the desired effect of noise, light and energy reduction. 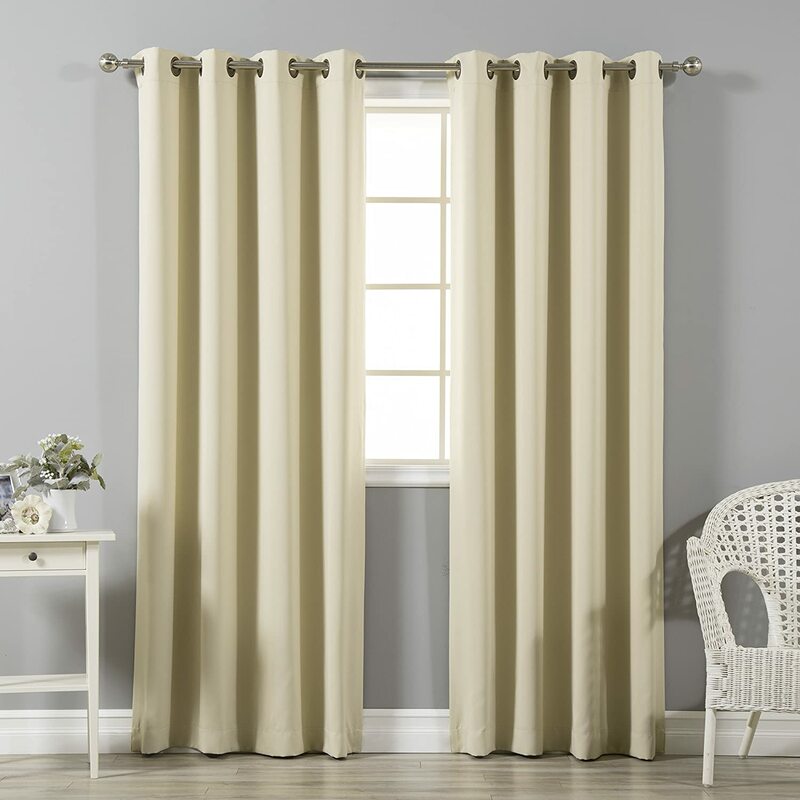 The makers of this curtain, Moondream, created a patent pending middle liner that is specifically insulated to just this curtain. On the outside of this liner is the blackout fabric and thick cotton which lines the back of it. The curtains come in four measurement options and each one is sold as a single panel. It is recommended to only dry clean these drapes when needing cleaned. These drapes seem to be a step above the rest with their patent pending sound proof technology, and independent lab testing. These are also two-toned curtains and not solid the way around. However, for the sake of getting 100% noise and light reduction, I may have to put aside my personal taste to try these curtains out for myself. One of the great aspect of buying noise cancelling curtains is the ease of their use. Obviously, no professional experience is required in hanging these or in getting them cleaned up. If you know the basics about their care, then you will no problem owning and maintaining them throughout the years. As you finalize buying the best noise cancelling curtains for your home, be sure to not settle for something that you will regret. 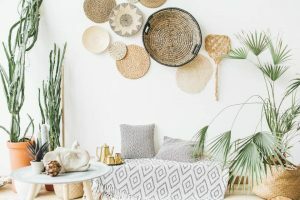 While you may have to forego a set of curtains you love because they won’t do anything for light or sound, you can get something that will still look nice, but will give you more privacy and peace that you so desire. Isn’t that more important in the long run anyway?